As many expos and conventions as San Antonio hosts, it’s surprising a large-scale guitar show has never landed here. 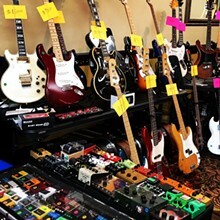 But that’s indeed the situation, and to remedy it, the owners of Robot Monster Guitars and Collectibles have launched the Alamo City Guitar Bazaar, the first of what they’re hoping becomes an annual excuse for musicians and hobbyists to mingle, haggle and horse trade for vintage, used and new instruments. Around 50 vendors from all over the country are expected to bring in 2,000-plus guitars. While similar events in other cities draw plenty of bargain hunters, they’re also magnets for deep-pocketed collectors. So, don’t be surprised if you see some jaw-droppingly rare axes with price tags on par with that of a new car.